Looking for a fun getaway with the gang? Why not learn something new while you’re at it. 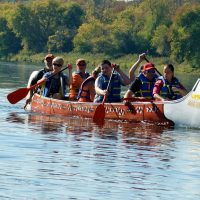 Local outfitters offer a range of unique experiences on the Grand River including stand-up paddle board lessons and paddling excursions combined with photography workshops, yoga classes, edible plant hikes and more. 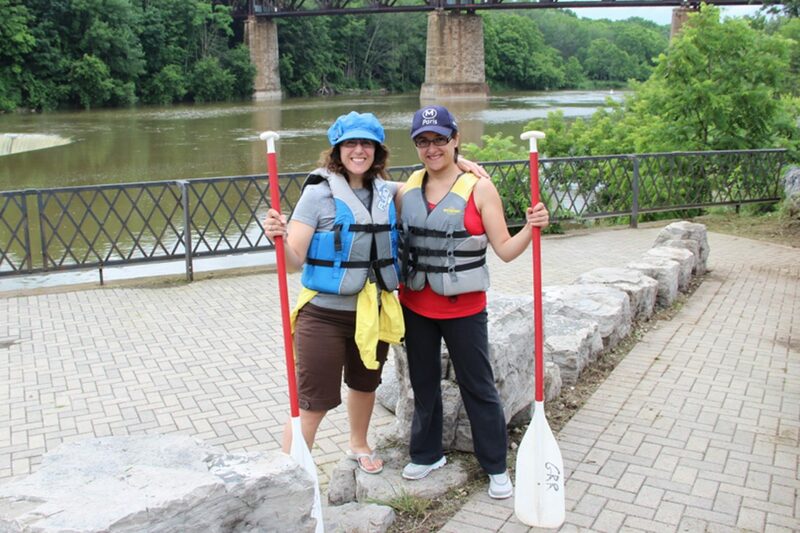 Read all about Diana’s rafting trip and edible plant hike along the Grand River from her blog Toronto Teacher Mom below. 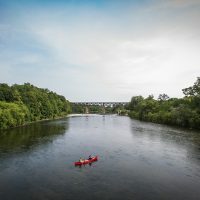 DIANA – After a lovely lunch at The Bell Homestead Cafe in Brantford, my friend and I headed over to the next location on our itinerary – Paris, Ontario for a complimentary guided tour of the Grand River with the Grand River Rafting Company. Initially, we had been looking forward to a canoe trip but when we arrived, we noticed they had brought rafts instead. I was a little disappointed at first but ten minutes into the tour with our amazing guide, I realized how much more fun it was to share a raft with my friend and learn so much about the area from Garth Pottruff, the owner of Grand River Rafting Co. and the recently acquired Heritage River Canoe and Kayak Co. Wearing my Paris cap (from my honeymoon in France) and a life jacket supplied by Grand River Rafting Co., we loaded up our paddles, cooler and personal belongings onto a hefty and virtually unflippable (is that even word?) raft. Initially, I wanted to bring the kids with me but wasn’t sure how safe it would be seeing as none of us are very strong swimmers. Being in the raft it became clear that this was the perfect trip for families with kids both young and old. Garth told us that he’s even taken children as young as two on rafting trips. Given that the water throughout most of this trip is quite shallow with a few gentle rapids, I felt more assured that I could bring my kids on a future trip and not have to worry so much about their safety. I have to say that, from a teacher’s standpoint, this guided tour along the Grand River is so worth it simply for its educational value alone. Garth, who happens to be an arborist and an outdoor education teacher for First Nations, is a wealth of information and taught us about the local wildlife and aboriginal history. It had rained most of the day and my friend and I worried that it would rain during our trip, too, but after speaking to Garth, he reassured us that it would be the perfect afternoon for a rafting trip. And he was right! Of course, his weather predictions have only be incorrect twice in the past several years so clearly the man knows what he’s talking about. 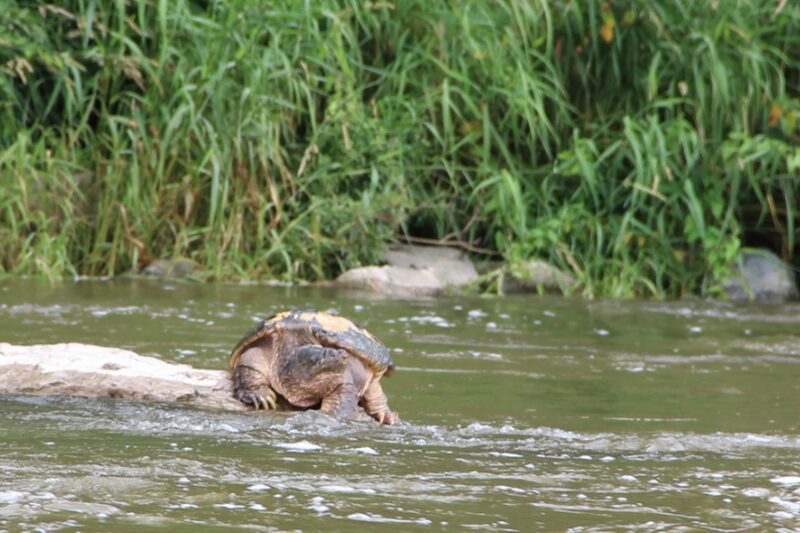 Along our trip, we came across turtles, blue herons and other beautiful wildlife that offered up some great photo opps. 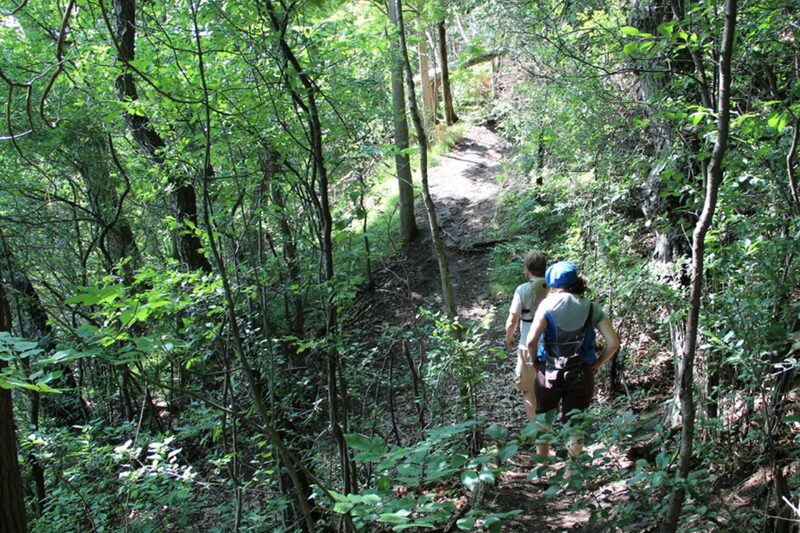 At one point, we stopped off at a natural spring, emptied our water bottles and filled them up with refreshing water straight from Mother Nature’s tap. 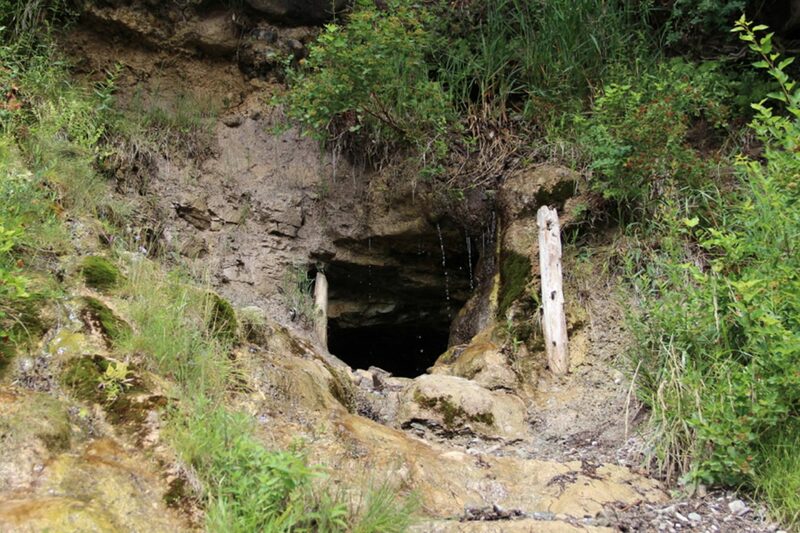 We also stopped off at a gypsum mine that had opened in the 1830’s and later closed in 1910. It was really dark and damp but nonetheless pretty cool to see up close. Throughout our hike, we learned about the different trees and about First Nations as well. We ended up at a beautiful lookout point before heading back to our raft. As we were nearing the end of our rafting trip, Garth called up one of the other guides to meet us at their private camp grounds, which are available for corporate picnics or family camping trips. They loaded up the rafting gear on the trailer and we hopped into the truck to make our way back to Bean Park. Our trusty Infiniti was there waiting for us to continue on our VIP Guest Drive and make our way over to the Old School Restaurant for dinner. We certainly had worked up an appetite after our 3.5 hour trip along the Grand River! I would like to personally thank Garth Pottruff of Grand River Rafting Company for providing us with an enlightening, humourous and truly enjoyable experience along the Grand River. This was my first rafting experience and undoubtedly not the last. I look forward to bringing my family back soon!